Margaret E. Lamberson entered into peace on March 20, 2017 surrounded by family in Olathe, KS. She was born September 7, 1929, in Springfield, MO, the daughter of Jason W. and Artie Cantrell McClellan. She lived on a farm north of Kansas City prior to moving to Olathe in 1939. She graduated from St. John’s Memorial High School (now Olathe North) in 1945, attended KC Business College and took American Institute of Banking classes. 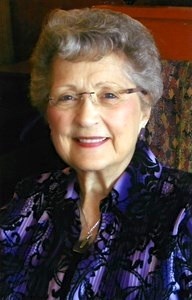 Her banking career started in 1945 at First National Bank, Olathe, and in 1954 she was employed by Robert R. Osborne at Patrons Bank where she became Assistant Cashier. She left Patrons in 1968 and continued employment with R.R. Osborne as his Executive Assistant in lending, real estate development, real estate construction and philanthropy that expanded almost five decades until his death in 2001. She was a member of Grace United Methodist Church of Olathe; Olathe Medical Center Charitable Foundation; Olathe Public Schools Foundation, Olathe Historical Society, William Cotton Chapter of Daughters of American Colonists & Olathe Medical Center Auxiliary. She served on the Olathe Medical Center Hospital Board for 8 years & the Olathe Health System, Inc. Board for 12 years. She served on the Mid-American Nazarene University Foundation Board & the Grace United Methodist Church Foundation Board. She served as Trustee for many Trusts as well as Charitable Remainder Trusts. Margaret was a woman of strong faith and loved The Lord. She so loved her wonderful family. She was an avid bridge player, belonging to several bridge clubs and was blessed with many friends. She was preceded in death by her parents; her daughter Mary Margaret Lamberson, granddaughter Paula Lamberson Summers: two sisters, Mary Creten and Pauline McClellan & brother, Donald McClellan. Survivors include her 3 loving children: David Lamberson (Britta) of Manhattan, KS, Lynn Jones (Jessie) of Tucson, AZ, and Brenda Nelson of Olathe. She is also survived by 6 grandchildren: Christy Hitoshi (Kehaulani) of Lawrence, KS, Sarah Lamberson Darby (Adam) of Olathe, and Audra Eckart (Kurt) of Lake Tapps, WA, Mark Lamberson (Sarah) of St. Mary’s, KS, Anthony Eckhart (Kylene) of Tucson, AZ, and Joshua Nelson of Olathe; 13 precious great grandchildren, a niece Genny Creten Rosenau (Mark) of Lenexa, KS, and a nephew Doug Creten of Leavenworth, KS. In lieu of flowers, the family suggests memorial contributions be given to Olathe Medical Center Charitable Foundation, 20333 W. 151st St., Olathe, KS 66061 or to Grace United Methodist Church of Olathe.